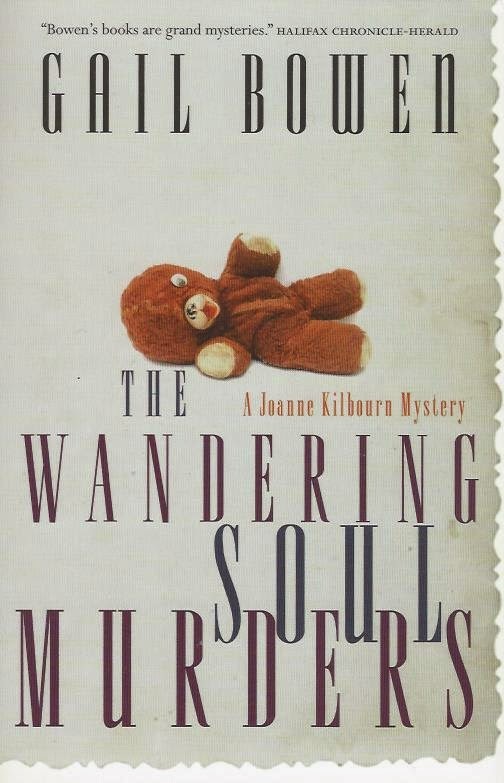 In the early books of the Joanne Kilbourn series, Joanne is a political analyst and a writer. Her position makes it possible for Bowen to highlight political and social issues in her books. Joanne is a widow with four children and family comes first with her. The latest addition to the family is a young girl who she adopted. Taylor was the daughter of a close friend who died. Her oldest child, Mieka, has left college to start a business, a concern for Joanne. Because she cares so much, for her family and for others, Joanne sometimes makes questionable decisions. Her vulnerability and her determination make her an interesting character. The subject matter in these novels is certainly not cozy. The deaths in The Wandering Soul Murders are horrifying, but not graphically portrayed. The first victim was working temporarily as a cleaner in Mieka's new business. It turns out she had been a prostitute.. There are more deaths, and Joanne's searching for answers turns up hints of child prostitution. All the Joanne Kilbourn mysteries that I have read feature murders of very close friends or the cases involve close family relationships. It seems that it is dangerous to know Joanne. This is one of the problems I have with amateur sleuths. Yet her close involvement with the victims does lend validity to her decision to strike out on her own to find out more about the victims and the crimes. Setting is very important in Bowen's books. The descriptions and use of the Saskatchewan locations are interesting and contribute to the feel of authenticity. The writing and characterization pulled me into the story. Source: I purchased my copy.. Thanks TracyK - this is a series that seems well worth embarking on - is it still running? Sergio, I just saw that she has a new novel in the series (the 15th) coming out in March 2015. So yes. I think the first one was published in 1990, so it has been going for 25 year. Tracy, I'll have to let you read these for me. Not enough boxes ticked for me to get involved I'm afraid, plus no time and too many books already. Col, I am in the same boat as you as far as time and too many books. This has been a horrible work week and very little spare time for reading / blogging activities because I am soooo tired. This author is probably not for you, but maybe Moira could convince you that she is. But not cozy. Just not gritty either. I think I might have read a book in this series years and years ago. Isn't she a professor or something? I remember liking it, but can't think of the title. Glad this is a good series for you. I looked it up and this series is still in play. New book to come out in March. Oh I should have read your comment, Kay, before going to look that up. She is a professor in later books for sure. I do like this series, and especially because of the setting, but I am not so much a fan of amateur sleuths. I do hope you like Gail Bowen's books, Shalet Jimmy. I have seen her compared to other authors, but I think she is unique. Tracy - So glad you liked this one! In my opinion, this is one of the really fine amateur-sleuth series out there. It's just really well-done. And in my opinion, it's consistently good, too. I am glad to hear that you think that these continue to be good, Margot. Sometimes later books in a series can be disappointing. Tracy, as you know I really like this series, though I'm not sure I'll ever convince Col of its merits. As you say, they aren't cozy at all, but they do tell you a lot about Joanne Kilbourn's homelife, which I love. I also really enjoy all the issues she raises in the books, and the fact that she's a good lefty feminist! Moira, I think I liked this Gail Bowen book the best so far of the three that I have read, and I don't think that comes across in the review at all. The reviews for the first two were much more enthusiastic. I actually like less personal stuff in mysteries, but this series has so much to offer that I accept that here. I know many readers rave about her work. I'm not sure if I'll ever read her but I'll keep her mind. Thanks for reviewing this. I had to smile at the line where you said that it must be dangerous to know Joanne. Observations like that and others (high crime rate in a small town, etc) can sometimes kick you out of the story and remind you that you're reading a book after all. Obviously we are but it's not always good to be reminded. Keishon, as I grow older I think I am thinking too much about what I am reading, while I read it. Getting lost in a book can be more enjoyable. On the other hand, I like that I am now looking back at the books and figuring out what I liked and why. As for Gail Bowen's books, you might enjoy them but there are so many books and series that we cannot read them all. It is thrilling that there are so many authors... old and new... available to read now. Bernadette, I have the same problem with a number of authors. And sometimes I even have more books by the author on my shelves. There are some Australian authors I have trouble finding, mainly because I prefer paper copies. I am going to have to bite the bullet and read the next Sulari Gentil book in the ebook version. I just saw the review for A Decline in Prophets at Brona's Books and that is the one I need to read next. TracyK: As you know Gail is one of my favourite authors. She has created a family saga that is focused on mysteries that has gone on for over a generation as her children grew up and now have children. It adds to my enjoyment to know that some of the characters on patterned on her real life family. I appreciate her mysteries are not awash in blood. I have never worried about the number of murders around a sleuth. It is a part of fiction I accept as necessary for a series. I am more concerned about whether the mysteries are interesting. Bill, I do know that this author is one of your favorites. I also know my prejudice against amateur sleuths is unreasonable. After how many mystery novels are very realistic anyway? Can't get away from that prejudice though. I just make allowances for authors like Gail who have so many other good characteristics in their books. I imagine I will go through the series at the pace of two or three a year, although that really cuts into my book buying budget unless she shows up at a book sale. Right now I am wondering about reading them out of order. In a series like this, it seems that would not work well for me. I do not think you want to read them out of order. You will not get the same flow of family development. Good, glad to have confirmation on that. I now have #4 and #8 and I will find the ones in between. Tracy, I got to know of Gail Bowen and her Joanne Kilbourn series over at Bill's blog where I read a review of one of her books followed by an interview with the author. I have been guilty of neglecting Canadian fiction and it's something I need to remedy. Prashant, I have enjoyed a lot of Canadian fiction. I like the different setting.